As a parent, I’ve leared how to say no to requests from He Who Will Not Be Ignored that originate from watching television commercials. It’s easy to deny requests for toys or games, but it’s harder to refuse suggestions about food, not because I think the advertised product has any merit, but because He Who Etc. seems to be particularly susceptible to food ads. I know, because I was once suckered by a TV commercial when I was a kid. Maybe you remember ads for SpaghettiOs: “The neat round spaghetti you can eat with a spoon, uh-oh, SpaghettiOs!” Even though the “uh-oh” should have been a tip-off (Who says “uh-oh” t o positively reinforce a point? ), I saw those ads and begged my mother to let me have SpaghettiOs for dinner. Mom, who makes the world’s best tomato sauce, finally broke down and bought a can, which she dutifully heated up and served me for dinner. It was awful, almost indescribably so. The “sauce” was more orange than red, sickly sweet, and watery. The Os were mushy and tasteless. After one spoonful I realized I had made a mistake, but the lesson didn’t end there. Mom made me finish the entire bowl, and served the rest of the can to me for lunch the next day, reminding me “We don’t waste food in this house.” She cured me of my desire for canned pasta, and I can claim to be SpaghettiO and Chef Boyardee free to this day. What reminded me of The SpaghettiOs Incident – as it is still referred to in the family chronicles – was this article about a Campbell Soup recall of 15 million pounds of SpagehttiOs. When I saw the amount, all I could think was How many kids re still being sucked in by those ads? About 30 million cans, whose absence will hardly be noticed, were made as part of a yearly production run. Either the stuff has gotten much better over the years, or there are a lot of beleaguered mothers with less fortitude than Mom. Right on the heels of the unsafe SpaghettiOs news was this article in The Guardian, brought to my attention by one of my readers. 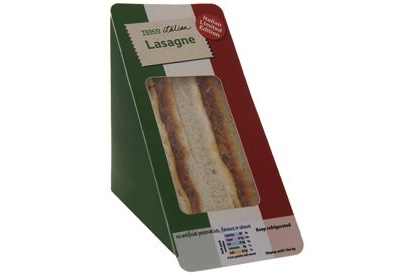 I’ll leave the details to the original report, but the gist is that Tesco, the largest convenience store chain in the UK, now offers a lasagna sandwich. It will sell at least as well as SpaghettiOs (hey, maybe the 30 million cans are sold overseas. ), but why are the biggest food crimes against Italian cuisine? I’m resigned to the existence of bad pizza, bad pasta, and lousy bread – I’ve even eaten lasagna that had cinnamon and nutmeg in it – but none of those compare to this latest abomination. Vinny Testa’s is a crime against humanity. Compared to SpaghettiOs and the lasanwich, Testa’s is Mario Batali. My lasagna always contains nutmeg, because I always add a little to my bechamel. You shouldn’t be able to really taste it, though–that would be horrible. The sad thing is that there are people who grew up eating SpaghettiOs and the like because no one in their family cooked, so they never learned any better. Yup, nutmeg in the béchamel. But lasagna isn’t supposed to taste like kugel.